It was a scene straight out of a classic teen movie. The students, in matching t-shirts, were packed into the stands of the gymnasium. An emcee implored the crowd to make more noise at semi-random moments. Administrators, coaches and staff fired up the kids, and the Carl Albert High School varsity boys basketball team was introduced through one of those quintessential human tunnels. It was, in the teen vernacular, lit. But there was a poignant moment for the students of Carl Albert, in the midst of their celebrations of Thursday’s State Championship playoff game against Washington High School. Former teacher and coach, Richard Morris, who retired last year, was being honored. Morris is paralyzed from the chest down and only has movement in his fingers. One of the most beloved teachers in Carl Albert memory, Morris has clearly made an indelible impact on the students. One by one, they took the mic to tell their former teacher and coach just how much he means to them. Students started to notice throughout the afternoon that things were a little bit… different. There were more cars in the parking lot than normal. Some videographers and photographers mingling about. And a heavy Nike presence, including those matching “Never Stop” Carl Albert t-shirts. In the midst of a silly exercise where the boys basketball team was blindfolded with bandanas and made to have a dance competition with one another on the court, a growing gasp emerged from the crowd. Thunder forward Paul George entered the court from an entrance underneath the stands. None the wiser, the boys basketball team kept dancing, until fellow students got enough of their attention to press pause. The bandanas dropped, as did jaws. Paul George was on their court, where they scratch and claw and sweat it out to get better every single day. George delivered a message of encouragement to the student body and to the team, to come together as one, lean on one another and leave it all out there on the floor. 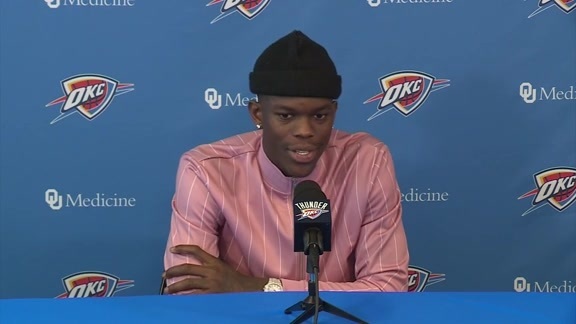 It was his chance to once again show that although he’s a relative newcomer to the area, he understands the commitment and positive energy Thunder fans in the area provide. 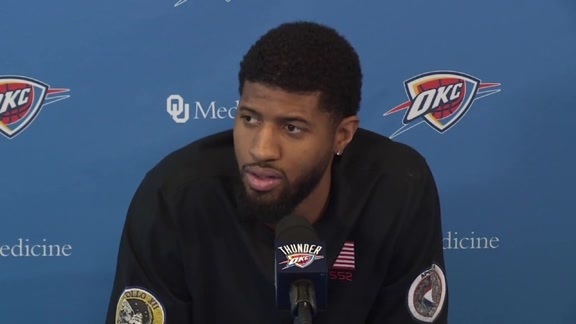 “It’s about being here, being supportive, being involved with the community and just being mindful of the love that’s been here and let them know that it’s being dished out the same way that I’ve received it,” George said. The Thunder All-Star forward had a little gift for each of the players on the boys basketball team for their big game on Thursday, and also for the varsity girls basketball team too. A massive cart full of shoe boxes was rolled out to center court, and George passed out a new, not-yet-released version of his Nike PG2 basketball shoes to each player. “I’m gonna go home and put ‘em on right now,” said Mikaela Turner, a senior who plays on the girls basketball team. Once all the students had their new kicks, one pair remained. George took the box, searched the crowd and found the man he was looking for. In the corner of the court, soaking in all the excitement and joy, was Marc Morris, the educator and mentor who has been so adored at Carl Albert. George strode over to the court, gave Morris the shoes, shared a moment with him and gave him a hug. It was the perfect culmination to the celebration. “Mr. Morris, he just knew how to talk to us, all my peers. He was a great teacher,” Harrell explained. “He had a really fun class. Just seeing Paul give him some shoes means a lot. Moments after the pep rally came to a conclusion, George stood atop a concourse, overlooking the floor. Students, teachers and coaches still milled about in a sort of wired, listless state. The whole day had just been too good to be true, yet tomorrow’s game was still on everyone’s mind. As he gazed over the teenagers, so present in their moment, George knew that they would remember this day, this pep rally, for decades to come. 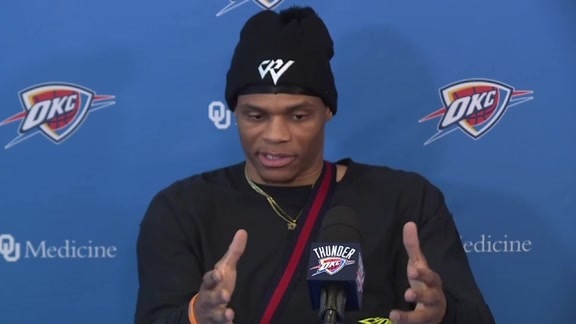 He knows that because he still has a vivid memory of his, and he wanted to provide this group of Oklahoma kids with a moment that will last a lifetime.